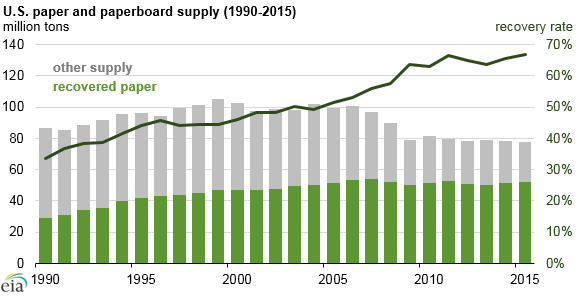 The recovery, or recycling, of paper and paperboard has increased from 34% of supply in 1990 to 67% of supply in 2015. Most of this recovered paper is consumed in the United States, but some is exported. Based on data from the American Forest and Paper Association, domestic consumption of recovered paper at U.S. mills increased to 31 million tons in 2015, while net recovered paper exports increased to 21 million tons. Compared to new wood pulp, recovered paper typically requires less energy to process into paper products. The recycling rate for paper has remained near 67% for several years, and there may be limitations on how much higher the rate can go. Changing demand for paper products can also affect the extent to which recycling is possible. Recovered paper and paperboard includes corrugated cardboard, newspaper, and miscellaneous mixed paper such as office paper. These post-consumer recycled products would have otherwise been discarded, and are distinguished from pre-consumer recycled products, which are mostly scrap generated in the production process. Instead of harvesting new wood, recycled paper is gathered from various waste streams, wrapped in tight bales, transported to a paper mill, and stored in a warehouse until needed. Various paper grades, such as newspapers and corrugated boxes, are separated, as paper mills use different grades of recovered paper to make different types of recycled paper products. Preparing post-consumer paper for the pulping process may require de-inking and other processes to remove contaminants. Some paper products contain 100% recycled paper, but in some cases new wood fibers are combined with recycled fiber to meet quality requirements. The Reference case of EIA's Annual Energy Outlook 2016 expects the paper industry’s energy consumption to remain near current levels (about 1.8 quadrillion British thermal units (Btu)) through 2040. Most of the energy consumed in creating paper products is in the pulping process. Pulping involves separating fibers from wood or recycled inputs. Pulping can either be done mechanically or chemically. Mechanical pulping involves pressing and grinding wood and recycled paper to separate the fibers, while chemical pulping uses chemical-water solutions to dissolve the lignin in wood to separate the fibers. The Kraft chemical pulping process accounts for the majority of U.S. pulp production. Although energy savings associated with recycled paper are significant, there are also variations in energy consumption associated with the different processes and approaches to operations management. The Institute of Scrap Recycling Industries estimates the energy saved from using recycled material versus virgin materials is as high as 68%. For example, processing wood through the Kraft chemical pulping process requires 10 to 12 million Btu per ton. Recycled pulps require about 1 to 4 million Btu per ton. A number of processes are required to prepare the pulp for the paper mill, including drying the pulp, which is typically an energy-intensive process.